September 2011 – Page 2 – Teach. Brian. Teach. What would it look like if I tried to do standards-based grading in my inquiry course? That’s a question I’ve been thinking about a lot. Here’s a quick rough draft of some more precise learning goals. I reflect upon my own experiences and explore my own thinking as sources for possible ideas about how the world works. I articulate my own thinking and ideas about phenomena in clear and specific ways that help others to understand them. I express my ideas and thinking through drawings, sketches, diagrams, graphs, etc. I seek out evidence to support claims that I make, and use evidence or examples to support or refute claims. I go beyond just citing evidence by providing the rationale that explains why evidence either supports or refutes claims. In the face of evidence that run counter to my ideas, I return to my ideas to ask questions and reconsider my thinking. I develop explanations that tell a gapless story that detail exactly how specific conditions give rise to certain outcomes. I explain things that are confusing to me in ways that help others understand exactly where my confusion lies. I listen to my peers as source for ideas about how the world works. When I don’t understand someone else’s idea, I inquire either by asking questions, trying to summarize what I thought they said, etc. When I disagree with an idea, I provide a critical perspective toward this idea by constructing counter-arguments, citing contradictory evidence, or finding the flaw in some reasoning or premise. I respond to counter-arguments by attending to the argument itself–perhaps by attending to some inconsistency in the reasoning or the faultiness of some premise. When my thinking departs from our class’ foothold ideas, I recognize this to be the case and point it out. On Monday, I wrote about some of the theories and puzzles about light that my class is making contact with. I was excited about their ideas and excited about their puzzles. In this post here, I want to tell you about the mistake I made in moving forward. I had decided that my goal for class should be to help them bridge the gap between their ideas and their puzzles. My idea was to give them a question that would act as a stepping stone. First, it is safe to say that didn’t go all that well. Not at all. Students really struggled to understand what I was asking them to do. They struggled to apply some of the ideas they or others had come up with. They struggled to work out their implications. They didn’t see why I was asking them to do this. In general, the day was also just a combination of boring or frustrating–not just for them, but for me as well. No point lamenting over a bad day. So, the question is why? I came up with three categories of things I failed to do: anticipate, implement, and, finally, maintain the big picture I have for this course, which is student generated scientific inquiry. I totally underestimated the difficulty of the task, both in general and for my students. I totally underestimated how we (as a class) understood the ideas I was asking them to apply. These ideas were brand spanking new. I underestimated their propensity to carefully construct diagrams, which would be necessary for carrying out the task. I underestimated the difficulty we would have in agreeing about what we observe. I let my own exhaustion be at forefront of my classroom demeanor. I had worked at 14 hour day the day before and was both mentally and physically fatigued. I was certainly not at my best in terms of of patience, listening, and empathy. Rather, I came off as tired, disinterested, and impatient. I do think that good demeanor can go a long way in diffusing a troubled lesson, but I was making a bad lessons worse. Second, I forgot that my whole plan was to talk about careful diagramming AFTER the activity. Instead, I became a nit-picker during the activity. I pressed too hard and obnoxiously with several student groups. I felt like I was nagging students, which is not where I want to be. By not sticking to my plan, I let the worst of my classroom demeanor snowball into frustration for everyone. My activity was inherently about deception. In my plan, I wasn’t going to tell them that they had really specific and strong theoretical ideas, which I thought they could try to use to explain the puzzles they are interested in. Instead, I concocted some secret plan to sneak them from where they are to where I wanted to be. To me, deception in teaching is something to be avoided; and I fell for the trap, not only in the moment (which happens), but by design (which is scary). Designing deception into my curriculum is far far from where I want to be. Lastly,the activity inherently took agency and authority away from my students. Instead of letting them continue to pursue their great ideas, questions, and puzzles, I strangled them in an activity that I thought was more worthwhile than their own curiosities. And I was wrong to do so, and wrong about the activity. If I really thought there ideas and puzzles were so great (which I do), why didn’t I let them run with them until they really needed me to step in. I don’t believe I did any permanent harm, but there is certainly some repair that’s going to be needed. Fortunately, I have a 5 days to think this over. What am I going to do now? Nachos and beer. As I’ve mentioned before, MTSU is a UTeach replication site, named MTeach. Among many things, MTeach offers two one-credit courses called “Step 1” and “Step 2”, where students get to dip their toes in the water of math and science teaching. In “step 1”, student pairs get to make several observations and co-teach several inquiry lessons in a local school as they are learning about inquiry teaching. What is nice is that they get to do so with the same teacher and classroom throughout the semester. In “Step 1”, teachers choose from a list of maybe 30-40 possible lessons that the student pair will have to learn and then tweak to fit their class. Each pair gets several opportunities to practice teach their lessons and get feedback before going off to the school. With over a hundred students in MTeach, their are many students to help. In the past week, I’ve had a chance to talk to several step1 and step 2 students about their lessons. Their lessons are structured using 5E’s: Engage, explore, explain, elaborate, and evaluate. So far, my concern with the 5E’s is they seem (for students) to have little to do with student thinking and learning, so they easily get interpreted as “Get students’ attention with something cool”, “Get students to do something”, “Tell them what they should have learned”, “Have them practice what you told them”, “Give them a quiz”. (1) Inquire: Do something that will help you find the boundaries between what your students know and what they don’t know. (6) Solidify: Help students permanently stake out this new territory through elaboration, practice, extension, reflection, etc. IPELCS is not as snazzy as the 5E’s, but at least it is about things we know are important, including formative assessment, prior knowledge, zones of proximal development, epistemic agency and authorship in the classroom, disciplinary ways of understanding, scaffolding, and meta-cognition. Dont’ get me wrong. I am absolutely certain that any attempts to teach “IPELCS” would be reinterpreted by many students as “give them a pre-quiz”, “show them an exciting demo”, “let them play with the demo”, “tell them what they demo is about”, and “give them a practice worksheet”. I’m not suggesting that we go out and teach students IPELCS, because, ultimately, the problem with trying to teach anything like IPELCS or the 5E’s comes from not following its own advice. The issue of how to best engage students’ ideas about inquiry teaching and to usher them to the boundary of their own understanding is not a simple one. 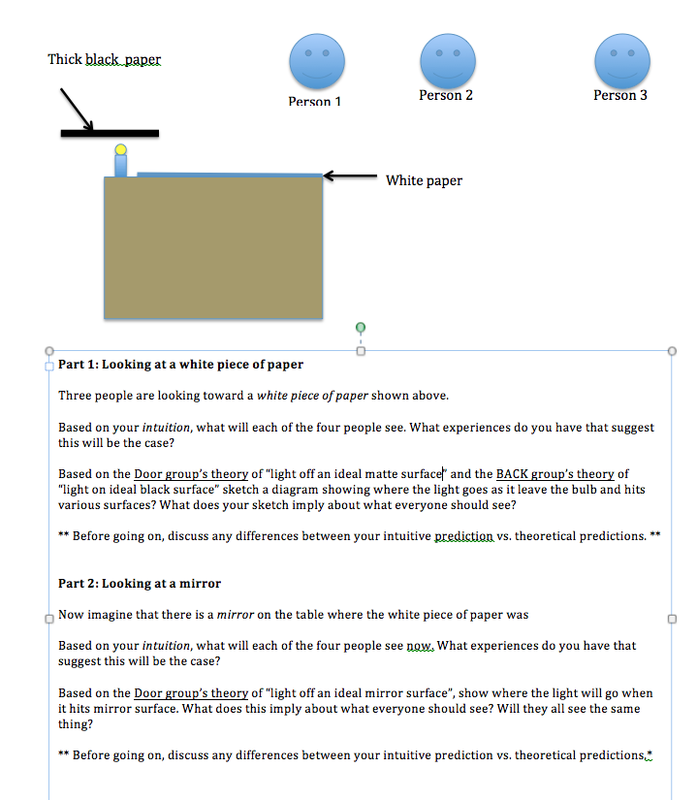 This post is about instructional decisions in my inquiry course, which I am trying to be more explicit about. If you read my last post, my class has some theories about what light does when it reaches different surfaces. They also have identified some challenging puzzles involving light on surfaces. Their theories are tentative and their puzzles are complex. I’ve decided that it’s my job to help them bridge the gap between some of our theories and some of the phenomena we’d like to explain. I think my students need some practice “holding a specific theory in mind” and working out its implications. So far, we’ve been doing a very different kind of scientific work–trying to sort through a swamp of our own ideas and experiences to reach some understanding of what’s going on. Along with this work, we’ve been changing our minds a lot, because we keep having new observations or ideas to contend with. To me, it’s about time we start “trying on some ideas” or at least “committing to some ideas just long enough to see where they lead us”. Conceptually, I also think they need to be nudged toward the vicinity of “source-object-receiver” models. I have been trying to push various groups in this direction during conversations here and there, but so far, no one seems to be concerned with it. Our ideas are about where light goes, and much less with who can see what from where. This is going to be pretty important if we are going to get anywhere with our puzzles, which specifically concern what different observers see. In summary, my goal is to narrow the gap between theories and puzzles. We have a lot of good theory and very interesting and revealnt puzzles. I also have two instructional instincts: these students need to make contact with a new kind of “scientific practice” (following implications) and a new “conceptual idea” (source, object, receiver). I also have some other goals, which function as constraints. For example, I want to honor and value the class as author’s of ideas and nudge them in directions that at least seem continuous with what we’ve been doing so far. Anyway, here is my first draft, for what we’ll be doing on Wednesday. They have some predictions to make based on below, some things to discuss, and then we’ll be moving forward with some observations. My final goal for the day will be to pin down some “community rules” for drawing diagrams, and maybe have a conversation about the difference between a sketch (which might get across the gist) and a diagram (which could be used to make a specific prediction). Anyway, what do you think? Today, in my inquiry class, research groups reported out about their investigations. Some groups did investigations that led them to propose some theories. 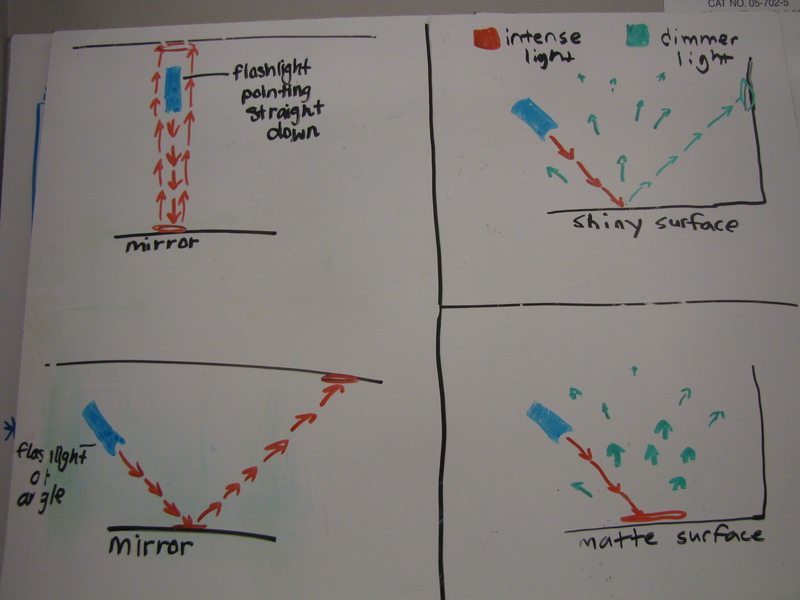 Here’s an example of a group proposing a theory of what they think happens when light hits mirrors, shiny surfaces, and matte surfaces base on their investigation. Here’s another group bringing attention to a puzzle they discovered and are trying to understand. The puzzle concerns why we can see two spots of light when the flashlight shines against a whiteboard. 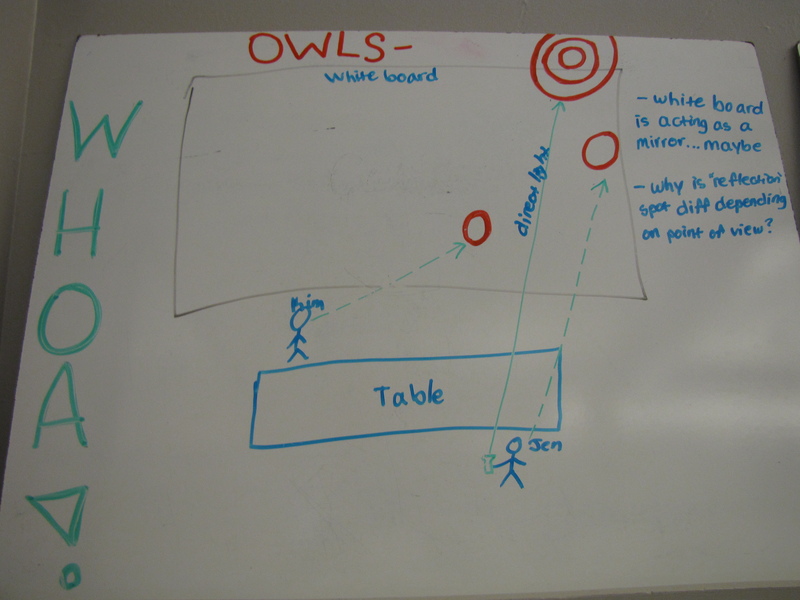 One spot of light is big and everyone agrees where to point on the whiteboard to locate it. The other spot is smaller and we don’t all seem to see it in the same place. Of course, the above theories are pretty much all that’s need to work out the puzzle. But our class is still far away from being in a position to do so. First, we aren’t all committed to the theories proposed above. For the moment, they are reasonable ideas, not firm theoretical commitments. Neither, do we know that those theories are the relevant ones for solving the puzzle. Neither do we really know how to apply those theories for the range of phenomena to which they do apply. Right now those theories seem to just explain where “light” goes, but we aren’t really in the vicinity of thinking about source-object-receiver models; nor are we thinking of images as explainable with where light goes. All we’ve done is generated some theories about what happens when light hits surfaces and we’ve generated some perplexing puzzles about what happens when light hits a certain surface. We have some fantastic theories and some fantastic puzzles. My job will be to help close to gap between the two. Flipped classes, computer-guided feedback, clickers, projects, group work, and white-boarding are not the ingredients for meaningful learning. Rather, these structures merely create opportunity for the construction of meaningful student work, for the real-time monitoring and responding to student work, for the cultivation of learning-oriented community, for enhanced epistemic agency. These opportunities are not only contingent upon how student learning is structured, but attention must be paid to what specifically students are to be learning and how best to structure their work specifically within those arenas. These opportunities are also highly contingent upon an instructor’s attention and responsiveness to community-building and to the fostering of individual’s agency to act within that community. Realizing opportunity is quite different from merely creating opportunity. Elsewhere, I have seen and been in classrooms where students have the opportunity to make contact with some forms of meaningful work (of one kind at least), but the conditions are such that community and agency are stifled. I have found this to be the case in many worksheet-driven, research-based curriculum. Students make contact with many important physics ideas by dragging them through well-thought-out and tested curriculum. These kinds of classrooms can get results, but I feel they often come with much collateral damage–community, agency, attitudes, joy of learning, etc. I can understand why some would advocate for the use of such materials. I think I can appreciate what value others see in them now more than ever. It is interesting to contrast my uneasiness with such curriculum with my current uneasiness. They are almost polar opposites. I am learning that I am just not interesting in teaching under conditions void of meaningful disciplinary learning OR meaningful learning community. I want both. I don’t think it’s too much to ask for. I know that it’s hard work–especially for me but for anyone who aims for it. But it can’t be too much to ask for. I want to define a kind of motion– a kind of motion in which an object starts from rest and always covers 3x as much distance during the 2nd half than the first half. Let’s say you cover 16 meters in some phase of a trip. By my rule, you would have had to have covered 12 m during the first leg and 4m during the second leg. 16 (total distance) = 12 (distance in 1st half) + 4 (distance in 2nd half). 12 = 6 + 6 ? It turns out that this can’t work because this says that the ball would travel same distance in the last quarter than it did in the previous one, and we know that it’s traveling faster later than earlier. 12 = 7 + 5? 12 = 8 + 4? 12 = 9 +3? It turns out that this can’t work because 3 is the distance it traveled in the second quarter, and we know it had to have covered more distance. It looks like pattern 1 looks like it is increasing by same amount each time 2 more meters for every segment; Pattern 2 is harder to discern if there is a pattern, it changes by 2, then 1, and then 4. 1+3+5 = 9 is the first half distance and 7+9+11 = 27 is the second half distance. Thus, I’m feeling more confident that the pattern 1, 3, 5, 7, 9, 11, 13, 15, 17 describes the motion of an object that always covers 3x more distance in the second half of a trip than the first half. All, I’ve just described is, of course, just constant acceleration motion.